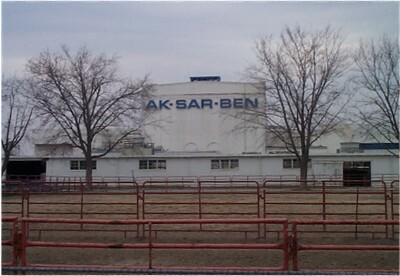 Ak-Sar-Ben, or Aksarben, was an indoor arena and horse racing complex in Omaha, Nebraska. Built to fund the civic and philanthropic activities of the Knights of Ak-Sar-Ben, the thoroughbred race track was built in 1920 and the Coleseum (capacity 7,200) was built in 1929. The racetrack closed in 1995 and the arena in 2002; the facility was demolished in 2005, and is currently being redeveloped for a variety of uses, including dormitory housing for the University of Nebraska-Omaha. Ak-Sar-Ben is "Nebraska" spelled backwards. The Knights originally said they were turning Nebraska around, thus "Ak-Sar-Ben." Ak-Sar-Ben Coliseum was the premiere ice rink and concert arena in Omaha for more than 70 years. Popular acts ranging from Frank Sinatra to Elvis Presley to Nirvana all performed to sold-out crowds. It was also home to the Omaha Knights, a minor league hockey team from 1959-75. The Knights began operations in 1959 in the IHL, and later moved to the now-defunct CHL, with teams affiliated with the NHL's Montreal Canadiens, New York Rangers, and both the Calgary and Atlanta Flames. The arena hosted the USHL's Omaha Lancers for its final dozen years and the Omaha Racers basketball of the CBA from 1989-97. The Coliseum also hosted world-class boxing, was a major stop on the PBR and attracted many popular comedians. Horse racing at Ak-Sar-Ben ended in August 1995, just ten years after its record season of 1985. Dog racing began in Iowa in 1986 and other forms of gambling followed, and attendance rapidly declined at Ak-Sar-Ben. A portion of the property was the sold to First Data Resources under the agreement that FDR would donate part of land for the University of Nebraska at Omaha for its Aksarben Campus to build a UNO's new College of Information and Technology. After the remaining buildings and grandstand were torn down in early 2005, a proposal was put forth to create a mixed-use development called Aksarben Village. Construction began in 2006 and the first businesses opened in 2008. Following the closure of the racetrack, a simulcast facility, Horsemen's Park, was opened in Omaha in 1998. The horse racing industry in Nebraska is now confined to live racing dates rotating from Fonner Park in Grand Island, to the Lincoln Race Course in Lincoln, and finishing at Agricultural Park in Columbus, plus a four-day meet at Horseman's Park (the latter required to keep their simulcasting license).